Let’s talk about Creeping Charlie, a weed that might be plaguing your yard. Creeping Charlie is a plant that may also be known as creeping Jenny, gill-on-the-ground, and ground ivy. Cultivated versions of this plant have been used for hanging basket decorations. Creeping Charlie has bright green oval-shaped leaves with scalloped edges. These leaves are about ¾ to 1 inch wide but can be bigger in fertile soil. They grow on a creeping stem in four-sided square configurations. These leaves have a distinct minty smell when crushed and the plant produces tiny bluish purple funnel flowers in the spring. 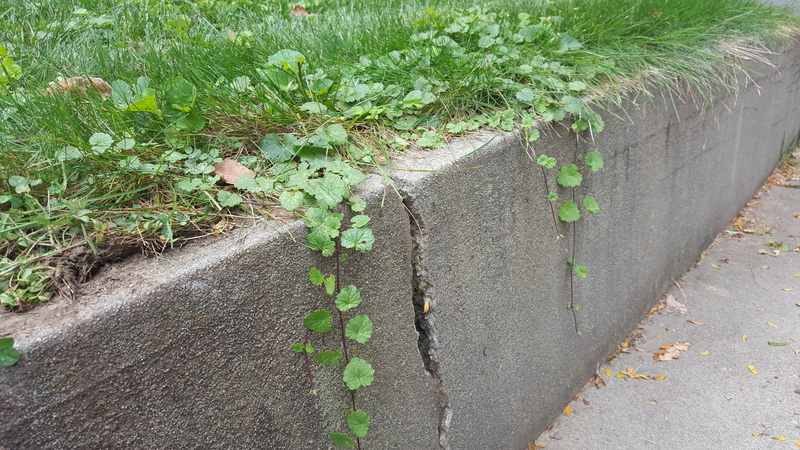 Creeping Charlie vine growing down concrete. These long vine-like flowering plants were originally brought to America as a potentially good ground cover plant—which, they are. The problem is that they can be a little too effective of a ground cover and are unfortunately pretty difficult to get rid of. They reproduce with roots at each node as well as with seeds. This is the main problem when dealing with it, because each root or bit of stem left behind from improper weeding can grow into its own plant. Creeping Charlie loves moist, shady places such as the north side of buildings or the ground underneath bushes and trees. 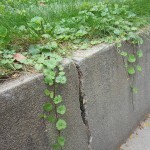 You can use knowledge to your advantage in preventing or getting rid of Creeping Charlie by increasing water drainage or watering less frequently to dry up the soil slightly. Alternately, more sun exposure can help reduce the spread, although creeping Charlie won’t just shrivel and die in sunlight. 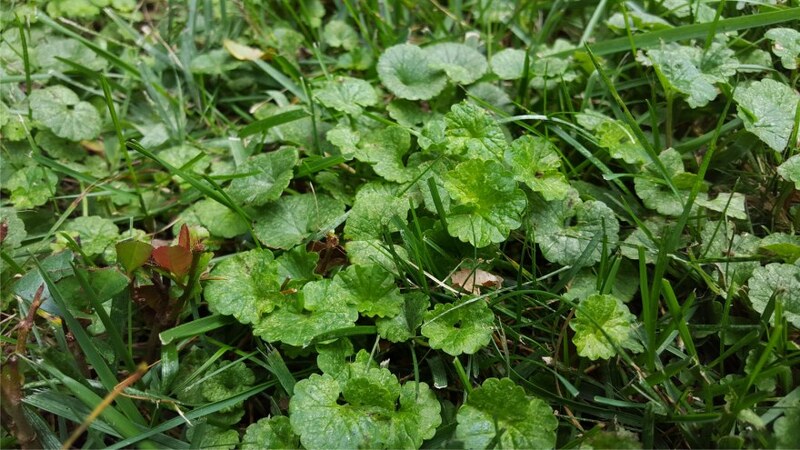 If Creeping Charlie is plaguing a thin lawn, careful mowing (to a height of at least two or three inches tall) and overseeding can help with the problem. As always, make sure you are growing the best turfgrass for your lawn to best utilize your soil and keep a healthy lawn. The best time to treat Creeping Charlie is fall. A commercial broadleaf herbicide will work to take care of Creeping Charlie but can be damaging to other plants in your yard and could be toxic to the environment, your pets, and your family. A popular alternative is horticultural vinegar. Different from regular vinegar kept around your home, this can be purchased for fairly cheap and should be applied carefully as it can damage skin or eyes upon contact. As with dandelions, there can be some positive benefits to keeping creeping Charlie around if you find you either can’t or don’t want to remove it from your lawn. Being a member of the mint family, Creeping Charlie has been viewed as a positive herb medicinally and in cooking for centuries. Creeping Charlie is toxic to horses, swine, and cattle. That being said, prior to the use of hops in ale and beer, it was added for a bitter flavor. The plant is rich in vitamin C and can be used in soups or eaten like spinach. With a bit of sweetener, the tops go excellent in tea. In addition to allegedly treating lead poisoning in the past, it was also used as an anti-inflammatory and as a treatment for ulcers and lung problems such as asthma. It is even being evaluated as a treatment for certain types of cancer. Different cultures use Creeping Charlie to treat everything from regulating menstruation to flushing the kidneys, treating arthritis and rheumatism, healing blisters and sores, and improving the complexion. As with anything natural or not, be careful to not partake in excess. If you are going to try Creeping Charlie in foods or medicine, be sure the plant has not been exposed to chemicals such as pesticides or herbicides. Furthermore, pregnant women or women who are lactating should avoid trying this weed because it contains pulegone, which can be extremely harmful to the development of an infant. In the battle for a healthy and beautiful yard, knowing what you’re up against is half the battle. Creeping Charlie is a formidable opponent, but it can be defeated…or possibly used in some tea. class="post-template-default single single-post postid-1205 single-format-standard samba_theme samba_left_nav samba_left_align samba_responsive wpb-js-composer js-comp-ver-5.0 vc_responsive"